I finished my first marathon last week, a personal mental marathon that took hundreds of hours to complete—my first year of medical school. Our last lecture on that final Friday afternoon was followed by a barrage of claps, applause, cheers, celebratory pictures for Facebook and Instagram photos, and a general sense of urgency to leave the building as quickly as possible. The sunshine outside was beckoning, the air felt lighter, and, in an appropriate fashion, many of us had to run to lab or research meetings to initiate our summer of required research. The feeling of finishing (well, surviving) an entire year of medical education was so overwhelming—overwhelmingly anticlimactic. I think I expected more exhilaration. “One step closer to earning an MD! MSWho? MS2!” Like a commercial, these were the types of captions I saw scrolling through my social media news feed the past month and a half, as dozens of my friends, and friends of friends, finished their first year of medical school across the country. I stockpiled my stores of adrenaline for the big day to arrive. Yet when it came, I realized that I felt no different than any other day. The moment came swiftly and left without much internal fanfare. Suddenly, I was an MS2, a badge that signified that a year of medical education was conquered and stored in my brain (somewhat), and that I was no longer the absolute rookie in medicine. The reality is, true joy in medical school doesn’t come at traditional checkpoints. On to the next thing, as the culture of medical school dictates. In the constant whirlwind of a curriculum that offers little time for breaks, typical timestamps of celebration become masked by the onset of the next deadline. The conclusion of one exam is immediately followed by the beginning of a new block or another required assignment, another clinic visit or another research meeting. 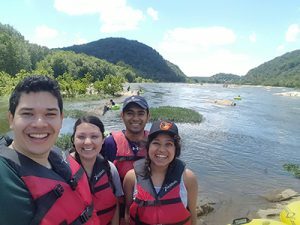 Johns Hopkins School of Medicine students taking a break from the lab to explore the great outdoors. As I’ve noticed, however, exhilarating moments do happen frequently in medical school, but more often, happen unexpectedly. Long conversations during 2 a.m. trips to the coffee machine with classmates before an exam, or scouring through dozens of pages of medical literature to satisfy an intellectual curiosity provide me with happiness like nothing else. Having a breakthrough moment in understanding a pathology of a complex disease or listening to a patient share his gratitude towards his medical team brings me a pure adrenaline rush. While passing an exam brings joy and relief, a year in medical school has taught me that hard work is simply the lifestyle—a lifestyle in which true contentedness blossoms from latency not by completing the required tasks, but from the most innocuous of moments, like receiving the trusting gaze of a patient sharing an intimate detail of his or her personal life. Although I may have not felt any different on Friday, I have been blessed to have received a year-long experience full of accomplishments and magical memories along the way. Each day brings its own opportunities for learning, growth and excitement. Studying medicine, albeit extraordinarily difficult, is truly an honor, and I look forward to seeing what new experiences my second year will provide. 4 Comments on "The Hidden Joys of Medical School"
Beautifully captured!! All the best for MS2 !! A lot of us don't realize what you "1st years" go through and it was 'pleasing" to read and will provide encouragement to future 1st yr. medical students.